Warn other drivers not to follow you during your birding Big Year. Don't Follow Me - I'm Having a Big Year! 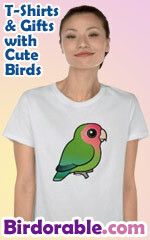 A fun gift idea for birders joining in a competition or having a Big Year on their own.